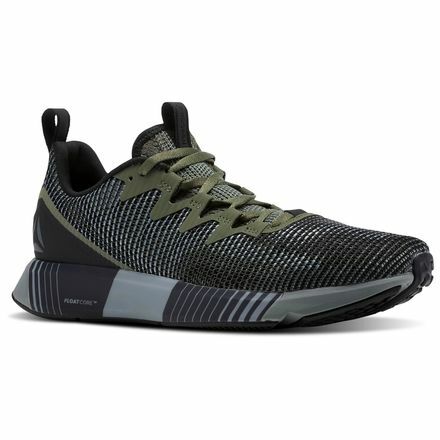 Kick your lifestyle into high gear with the help of Reebok Fusion Flexweave™ Men's Running Shoes in Hunter Green / Black. The innovative Flexweave™ upper is made with a unique figure-eight structure for dynamic support that won't weight you down or slip around. Floatride midsole foam helps maintain the lightweight feel while delivering much needed cushion. Rounding out the details is the new visual foot-mapped bottom. It offers controlled flexibility and traction for a more natural stride. Slip these on for your favorite 5K or just for a walk around the block. Flexweave™ Technology weaves supportive fibers into a figure-8 design to create a strong, flexible structure. Multi-Directional Support: Meta split outsole provides support and flexibility for multi-dimensional movement. Ultimate Cushioning: Midsole features Floatride Technology for ultimate cushioning experience. Floatride Foam midsole is significantly lighter than traditional EVA foam, providing soft, lightweight cushioning. Designed for: Running, cardio workouts, athletic looks. Heel tab for easy entry and heel clip for added stability. Color: Hunter Green / Black / Army Green / Flint Grey.